It’s beginning to feel a lot like Christmas. Lights, trees and tinsel have appeared out of apparently nowhere and suddenly our uni rooms feel a little barren. If you’re anything like me, your countdown to Christmas starts with two days of decorating the house and packing it full of enough Santas to fill the cast every Christmas film ever made. Each decoration is like an old friend, going back to its own place every year. But those Christmas decorations are quite expensive – and we’re students. So here’s how to get the Christmas vibe without damaging your bank account. A bit of sellotape, a couple of snips of scissors, and a little creativity can make your room a winter wonderland for less than £10 from ASDA. All you have to do is get a little creative. And if I could do it, you certainly can. There are so many cheap cards you can buy. Although they may look a little tacky, they make a brilliant set of bunting to tie from curtain rails to door hinges (seriously, people in Glasney, this works). Cut off the spine of each Christmas card. Use a hole punch to create two holes at the top of each card (or pierce the cards with scissors). Thread golden ribbon through the holes on each card, making sure they’re all facing the same way. Tie a knot at each end and hang them up! You probably have an old magazine lying around somewhere, beneath the hoodie still not put into the wardrobe or the uni books. They make brilliant Christmas trees and making them gives you inky fingers so you look like you’ve done work. Fold the first page of the magazine from the top right corner to the spine, so you have a right angle triangle. Take the small triangle beneath the level of the magazine and fold it inside. Turn that page over and start again. These are super easy and, if you get it right, they’ll stand up and not be at all wonky. You can also make stars like this! Fold two pieces of card in half width-ways. Draw in pencil the outline of half a Christmas tree and cut it out. Separate the two pieces of card and fold them length-ways. 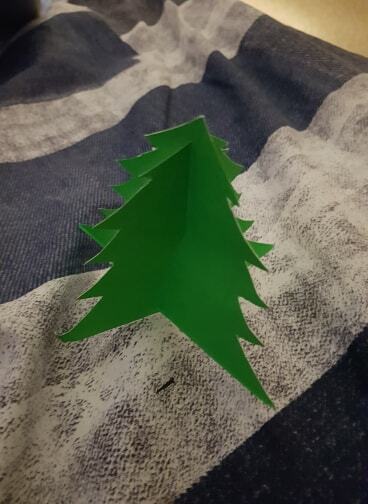 Cut one piece of card from the base of the Christmas tree to the fold line. Cut the other from the top to the fold line. Slot the two together. Cut further until they fit perfectly. So who’s got a load of plastic cups lying around after beer pong? Well, if they’re clean, here’s a fun way to recycle them. Fold a piece of card in half and draw the outline of half a wing. Cut it out and unfold the card. You should have a lovely set of wings. 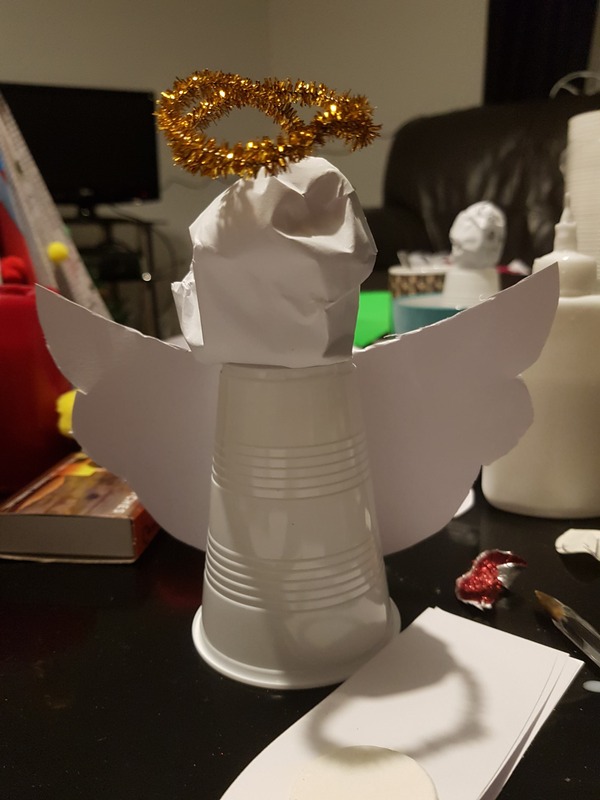 Staple or stick the wings to the cup. Crumple a piece of paper up and stick it to the top of the cup for the head. Add a face or halo if you want. These look amazing but take a little practice. Fold a sheet of paper into a right-angled triangle and cut off the excess. Fold the triangle again and cut three slits from the edge to the fold, parallel to the longest side. Unfold it carefully and fold the first two triangles together, sticking them. Fold the next two triangles the other way and continue to switch for the rest until you have a spiral shape. Repeat steps 1-4 eight times. Staple or stick two sets of four together and then staple or stick the two sets of four together. Using double sided sticky tape, attach each of the eight parts to their neighbours. These decorations are perfect to make with friends, so why not make an event of it by throwing in some finger foods and a compulsory ‘Ugly Christmas Sweater’ dress code?